These are WARM! They’re also super puffy. They’re the kind of mitten you wear when you don’t need a lot of dexterity. 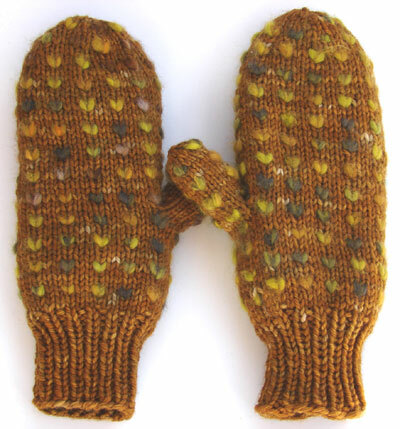 If you’re going for a walk or accompanying your little dog out in the yard, these are the mittens for you. Since Mark and I don’t let Shambles go outside by himself, you can count on seeing us standing out in the yard, freezing our butts off, about 8 times a day. It’s kind of brutal in the winter. The dog moseys around in what seems like slow motion as we jump up and down, trying not to freeze to death. These mittens are going to help. I’ve got the yarn for mine all dyed up and drying over a radiator (one of the few advantages to 10 degree weather is that the radiator dries yarn quickly), since I cannot wait to knit and wear them. ETA: Thrumming tutorial coming soon! ETA 2: Bloglines hates me so much! how whimsical! i love those! Ooooh, I’m in love! 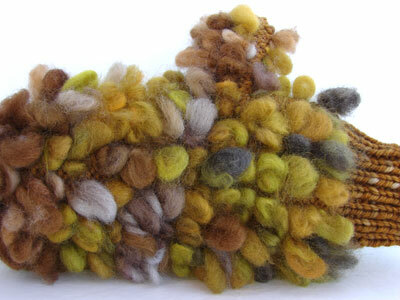 They look so warm, and the combination of colors in your hand-dyed yarn and roving is smashing. I’m with Lindsey, any good thrumming links online? I’d love to make myself a pair, although winter is coming to a close here in NM, so I probably won’t need them for a while! They are awesome — even the colors are warm. Can’t wait for the tutorial. 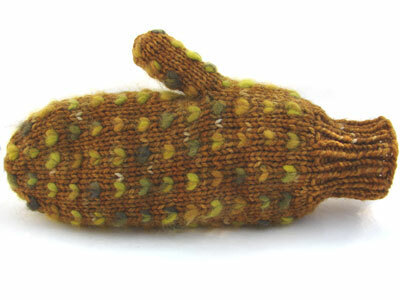 I’m mitten obsessed right now (cold weather will do that to a girl!). coool–I love the multicolored thrums! Very nice! I love the autumny colours. Oh, those are wonderful! I went out to get lunch and buy buttons after reading this post, and my very cold hands made me just think about thrummed mittens the entire time. I love the colors! They look great! Nice color scheme. They must be really soft and fluffy inside. those look so toasty! I love the colors also – very earthy…. Wow, your thrums are MUCH NEATER than mine. I wear my thrummed mittens for a total of about two weeks each winter, when the temperature dips below zero. can’t wait to see your tutorial! Marian and I like the thrums on the outside. yes, bring on the thrumming lesson. Those look massively, impressively, deliciously warm. I could have used some earlier this winter (though I’ll bet we still have many, many bone-chillingly cold days left, I’m on a vet-bill-inspired stash diet). I’ll have to make some for next season. They look perfect for a cold afternoon – I imagine ice skating on a pond with a sweetheart, one puffy mittened hand holding on to another. i would totally wear those inside out. very nice! i love it..i’m all about brown these days. that is so damn cool! you are a knitting, spinning, all things fibre rockstar, lady! holy crap. you blow me away. the mr. miyagi of fibre. the picasso. the donald trump. but with way prettier hair.